"Donalyn Miller" "The One and Only Ivan"
On two occasions, Colby, Cindy, and I have declined contributors’ offers for book reviews even though we loved the book. We did not review Linda Urban’s Hound Dog True—the book that launched the idea for Nerdy Book Club—until almost a year after the blog began. And in spite of constant mention in tweets and Nerdy Book Club blog posts and book lists, we have never posted a review of The One and Only Ivan. Are you surprised? I can wait while you google it. You won’t find one, but go ahead. Although we championed Ivan from the very start, we turned down over twenty requests to review the book. When The One and Only Ivan won the 2013 Newbery Medal earlier this year, we stopped getting review queries. The Nerdy Book Club was such a vocal supporter of Katherine and Ivan’s story that most contributors assumed we had posted a review already. Surely, Nerdy Book Club had reviewed Ivan by now. You can photograph a snowflake, but it’s not the same as watching one melt on your mitten. You can talk to your daughter on the phone, but it’s not the same as whispering in her ear while she sits on your lap. No review can adequately capture The One and Only Ivan’s special qualities. If you haven’t read Ivan with children, I claim that you still haven’t read it. Ivan is a wonderful book, but to the children who’ve experienced his story—Ivan is a friend. Ivan is a legend. I read The One and Only Ivan with my fourth grade class last fall. Every day, we sat on the carpet together, entranced by Ivan’s experiences. My students were horrified by the squalid conditions Ivan and his companions endured as attractions at the Big Top Mall. We talked about animals and our responsibilities to take care of them. We talked about art and how it provides happiness and comfort to us. We talked about what it meant to be a good friend. Ivan’s story is hard to bear and it was difficult to read sad moments out loud to my kids. On numerous occasions, Daniel would get up from the floor, wander over to the Kleenex box and bring it to me, saying, “I knew you were about to cry Mrs. Miller, I could hear it in your voice.” The box would pass around our reading corner until everyone took a tissue. Destiny sat at my elbow every day, peering over my arm to get a look at the illustrations first. I could feel her body grow rigid with outrage when Stella and Ruby received cruel treatment. Destiny loves animals more than your typical fourth grader—and that’s saying something. She covered her notebook and locker with animal photos. Whenever she needed a new book to read, she asked, “Mrs. Miller, do we have any more books about dogs or wolves that I haven’t read, yet?” Bob was Destiny’s favorite character, of course, and she worried all the way to the end what would happen to the scrappy little dog. We had our own Julia in class. She took special pride in sharing a name with Ivan’s artist friend. Whenever we read about Julia’s kindness toward Ivan and the other animals, our Julia beamed. When we finished Ivan, Julia was the first child to reread it. Her mother finally bought her a book of her own, so she would return our class copy. Racing to finish Ivan before winter break, my students and I spent every possible moment reading it. When we finished the last page, the kids begged me to read the author’s note. My apologies to my author friends, but in all my years of teaching this has never happened. My students weren’t ready to leave Ivan. If I had immediately turned back to page one and started over, they would have been up for it. Daniel was preoccupied with Neil’s arrival, so I had to find the tissue box on my own that time. On the day of the ALA Awards, my students were dismayed that they had to go to P.E. and couldn’t watch the Newbery announcement live. Promising them that I would follow the tweets, I was alone in my classroom when I read that The One and Only Ivan won the 2013 Newbery Medal. My respect for our P.E. coaches was the only thing that prevented me from running to the gym to tell the kids. When I rounded the corner to pick up the kids, I broke into a little hopping jog, and yelled, “Ivan won the Newbery award!” My students squealed and clustered around me, all talking at once, begging me to re-enact my exact feelings when I read the news. It was all I could do to get them back in a line and return to class. Colby Sharp had a snow day and was sitting at home when Ivan’s Newbery win was announced. I called him on my lunch break and we celebrated together—sharing our excitement and expressing our joy that Ivan would live forever because of that little gold seal. At the end of the year, my principal asked me to loop to fifth grade with my students. This summer, I attended my first Newbery/Caldecott/Wilder award banquet. Listening to Katherine’s triumphant acceptance speech and meeting her in the receiving line later, I wished my students could have been with me. Sharing my program and photos with the children this fall, they expressed their excitement and envy. I am thrilled that I was able to attend the ceremony and I will treasure the experience always, but my best memories will remain my experiences with my students as we read and shared The One and Only Ivan together. I have 26 students in my class this year, but our class members are legion. Alongside Destiny and Mathew’s names you can find Auggie Pullman, Laura Ingalls, Fern Arable, Martin the Warrior, and Ivan, the mighty silverback. Ivan is real to my kids. Although we discussed that The One and Only Ivan was loosely based on actual events, my students don’t care which parts are invented. My students consider Katherine Applegate Ivan’s biographer. You can’t downplay how important this is. It’s not a cute childhood fantasy. In the same way that Charlotte and Wilbur are real to me, in the same way that Searchlight is real to my daughters, Ivan—and Stella, Ruby, and Bob—are real to my students and will remain a part of them always. In my quiet heart, I know that our class will remain a part of them always, and Ivan is one reason why. And we still haven’t reviewed The One and Only Ivan on Nerdy Book Club. How could we review a friend? Donalyn Miller is a fifth grade teacher at Peterson Elementary in Fort Worth, TX. She is the author of The Book Whisperer and Reading in the Wild. Donalyn co-hosts the monthly Twitter chat, #titletalk (with Nerdy co-founder, Colby Sharp), and facilitates the Twitter reading initiative, #bookaday. You can find her on Twitter at @donalynbooks or under a pile of books somewhere, happily reading. What a beautiful tribute to this wonderful book and how books can change our students’ lives. This past week when I was reading a story by the author Avi to my class and it was lunchtime, I knew I helped my students to love a story when they all screamed,”No lunch, we want to hear more!” It is truly a satisfying moment for a teacher. What a lovely tribute! We, too, read about Ivan last year before he was famous! 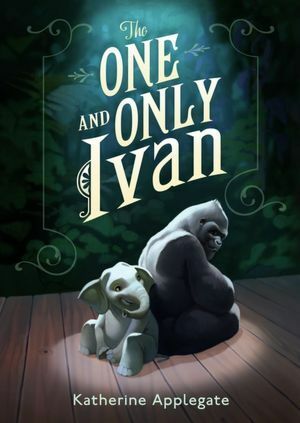 Right before we finished the book, I heard that Ivan had passed away at the Atlanta Zoo (after a good, long life!). When I finished reading the book, we did some follow up research in computer class because my kids just were not ready to let Ivan go. They were devastated when learned Ivan had died; in their lives, he JUST made it out of the mall! The power of great books. This book is magical. Have you compared it to Charlotte’s Web with any of your kids? My student friends and I often talk about Charlotte’s Web and Ivan together. Okay, I didn’t expect to be needing tissues myself at 7:54 a.m. on a Saturday morning. I love that they even wanted to read the author note. Wonderful piece, Donalyn. A great “review” by the one and only Donalyn Miller. I grew up near Ivan and regularly visited him at the B&I. My dad and I would stand at the glass and watch him and try to interact with him for long periods of time. He was a friend. This book was a lovely tribute to an extraordinary animal being. I miss him. I started the year with Ivan as a read aloud. I can see my students in your words. Thanks for sharing. Lovely. My daughter and I read it last year when she was in 5th grade. She was very proud when her younger sister would want to come listen and she’d could throw her out of the room, asserting that she was not ready to handle such a book. We passed the tissues too. Beautifully said. I have read Ivan to my past two classes. After reading it and Home of the Brave, my class in 2012 had the awesome pleasure of Skyping with Katherine Applegate. (Little did we know how extremely lucky we were!) Last year’s class had finished Ivan just before the Newbery awards were announced. We listened and cheered as Ivan was awarded the top prize. We even decorated our class door as a tribute to Ivan. It remained there to welcome this year’s class as a preview to what they will have the opportunity to experience this year. Thank you, Donalyn, for keeping the Ivan fire alive, and thank you, Katherine, for such an amazing work of love. I enjoyed your response, Debbie. I was at the Texas Book Festival during my fall school break (Austin, TX) in October, 2012 and attended a session where several authors talked about writing, reading, creating their books, etc. Katherine was one of those authors–it was such a delightful experience to be there! When I purchased her book and she signed it, she told me that she would Skype with my class if my plan to get a class set from a grant was successful (for several reasons that didn’t happen), but anyway I just wanted to let you know that I also love her book! What a beautiful post! Thank you. I know many teachers I would like to share this with. Ok…. I’m in tears. You pretty much stated what happened to my last two third grade classes when I read them Ivan. Too much for one heart to hold… Now that I have the library as my “domain,” I will have to share Ivan with all of the third or fourth grade classes… Haven’t decided which. Thanks for this Donalynn, such wonderful memories of my teaching days. The most important part of this review for me was: ” If you haven’t read Ivan with children, I claim that you still haven’t read it.” I loved the book but wasn’t sure I was going to read it with my students this year…have a big line up of books to be read. This post will make it happen! Thank you. This is an awesome post. I, too, started to get teary eyed. I am actually reading it aloud to my 6th graders right now. We just met Ruby and they moan when I have to stop reading. It is a magical book and I am not looking forward to telling them that Ivan passed away. Um… wow!! Although the life of a children’s author is one of fame and fortune :), this is what it’s really all about. Touching a small part of some one’s life like this is probably a big reason you teach and it’s certainly a big reason we write. Does Daniel have any more tissues? I love how this review is full of the miracle of teaching. Thank you, Donalyn. Sigh. So beautiful Donalyn. Thank you. I had the wonderful opportunity to read Ivan first alone, then again with my student book club and soon will read it aloud to my class. I can’t wait for the read aloud magic I know will happen. I love this non-review almost as much as I love Ivan. Thanks, Donalyn. My class last year knew about Ivan before he was famous too. This has been a rocky start to the school year, but we started reading Ivan the second week of school. Sharing a few minutes of Ivan’s story each day has become the highlight of each day. Yes this was a loving tribute to a wonderful book. When I read the book last year to my class they were so involved and so caught up in Ivan’s life. Beautiful writing Donalyn! Just a stunning essay about kids, teaching and books. Amazing post. My favorite lines were “and this is Ivan… he is part of the class too”. Oh, well, that made me cry! Thanks for capturing the essence of this book. One thing’s for sure: you’re a wonderful teacher and your students are invested in good stories. This post makes me so happy though I teared up a few times too. It also reminds me of the books my fourth grade teacher read aloud to us, the books that changed my life. Thanks for your good work. What a wonderful post, tribute and ode to a truly great book. Being a high school librarian, I didn’t know about this book; in a course I was teaching online titled YA Literature, Ivan was read and reviewed by one of my graduate students. I was enthralled by the cover and the story affected me, so I what I always do and passed it on to high school teachers and they LOVED it. This book not only speaks to children, it really reverberates with adults as well. Thank you Donalyn and Katherine Applegate. If you thought Ivan was great, wait until you get your hands on Home of the Brave. Applegate should have won the Newbery for that, too! Fantastic post. I especially liked your observation that one has not truly read One and Only Ivan until they have read the book with young people. So true. You never fail to make me cry. Thank you so much for the beautiful ways you share books with kids. Beautifully written:) I loved everything about Ivan! He is my favorite character of all the read alouds I have ever read. My students loved him as well. 🙂 This book touched my heart. Lovely “review” I read it to my class last year and half of them looped to third grade with me. They are insisting we read it again to the new third graders who weren’t there last year! Donalyn Miller … you are a some writer. I love this book and was looking for a review that could express how I feel about it. Your review had me in tears. Why? Great children’s literature crosses all ages. It is amazing that the insights I drew from this book – as a middle-aged man – were actually overshadowed by the wisdom of fourth graders. Wow. You are a some writer, too. The best blog comment ever. Thank you. I had the pure pleasure of introducing Ivan to my classroom of reluctant readers this past spring!!!!! WE LOVED the BOOK as we experienced all of life’s emotions together… loneliness, joy, heartbreak, laughter, anger, excitement, surprise….!!! The defining moment was when one of my students exclaimed, ” My mom and I ordered Ivan off Amazon and it will be here in 2 days!! !” Thanks to KA, my class was forever changed because of this book!!! !